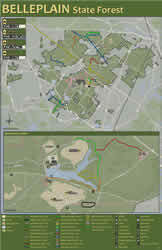 * GPS user please type in the above address under Park Location or use the GPS coordinates below. Do not type in Bellplain state forest that will take you to a dirt road. The forest can be reached via the Garden State Parkway by taking exit 17 southbound (exit 17) to Routes 9 and 550 or exit 13 northbound. Highway signs are provided to guide the motorist to the forest. 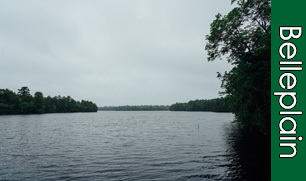 The forested acres of Belleplain include stands of young pine, oak and Atlantic white cedar, reflecting better soil conditions and less damage by fire than found in the Pine Barrens just north of the forest. 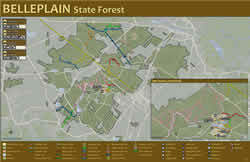 Belleplain State Forest was established in 1928 by the State of New Jersey for recreation, wildlife management, timber production, and water conservation. In 1933, three camps were set up by the Civilian Conservation Corps (CCC) Reforestation Relief Act, supplying labor to the forest for over an eight-year period. The CCC converted Meisle Cranberry Bog into Lake Nummy, a popular swimming, boating, and fishing area. They also constructed the original forest headquarters, maintenance building, a road system, bridges, and dams. Through the Carry-In/Carry-Out Program you can help us keep the forest clean and beautiful by carrying out the trash you carry in. Bags are provided throughout the site. Thank you for your cooperation and remember to recycle. Office Hours: Open daily 8 a.m. to 4 p.m.
Campsites: 169 tent and trailer sites with fire rings and picnic tables. Flush toilets, showers, and laundry facilities are within walking distance. Trailer dumping station is open March 1 through November 30. Open year round. Fees: NJ Residents: $20 per night; Non Residents: $25 per night. Group campsites: Two group campsites with fire rings, picnic tables, water, and chemical toilets. Each site accommodates up to 50 people. Open year round. No trailers at group sites. No pets allowed. Fee: NJ Resident $100 per night; Non Resident $200 per night. Lean-tos: Fourteen lean-tos with propane heaters. Each accommodates up to six people. Outdoor picnic table, fire ring and grill. Flush toilets, showers and laundry facilities are within walking distance. Lean-tos are completely empty on the inside. No pets allowed. No additional tents/trailers are permitted at the lean-to sites. ADA Accessible. Open year round. Fees: NJ Residents: $40 per night; Non Residents: $45 per night. Shelters: five shelters are located in Meisle campground. They are cabin-like structures with a wood stove for heat, two double deck bunks and a picnic style table. The shelters sleep 4 comfortably, but you may have up to 6 people . Each site includes a fire ring, picnic table and a charcoal grill. Flush toilets and shower facilities are nearby .Additional tents are not permitted on shelter sites. Pets are not permitted on shelter sites. Check in time is 3 p.m. and check out time is 12:00 Noon. Accessible to persons with disabilities. Fee: NJ Resident $48 per night; Non Resident $60 per night. New Jersey Resident $55 per day, plus applicable parking fees. Swimming is permitted on the north side of Lake Nummy while lifeguards are on duty. Please check our swimming schedule prior to your visit. Visitors will find a beach complex containing changing area, restrooms, a first-aid station and a concession offering refreshments, novelties and beach supplies. Inner tubes, rafts and other flotation devices are not permitted in the swimming area. Only Coast Guard approved life jackets are permitted. Pets are prohibited on the beach. Parts of Belleplain State Forest are open for hunting. For information about hunting, refer to the New Jersey Fish and Wildlife Digest or contact the park office.